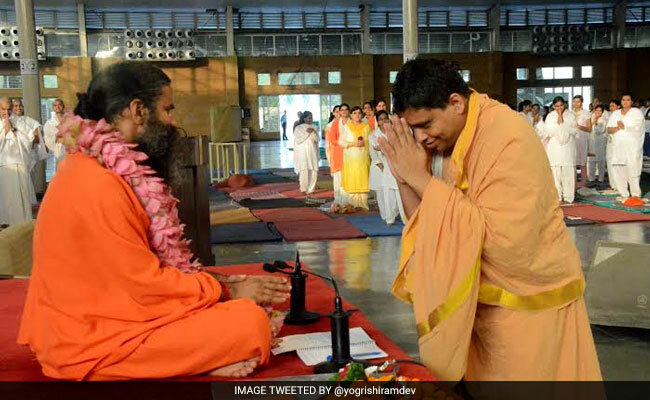 Acharya Balkrishna, who heads Baba Ramdev's Patanjali Ayurved empire, is among India's richest. There's nothing about Acharya Balkrishna's appearance that signals Chief Executive Officer. But his lungi and kurta are apt attire for the top boss of an empire with its roots in yoga. As the head of the Patanjali Group, which started in 1995 in Haridwar as Divya Pharmacy of Ayurvedic products, Balkrishna has just entered the Forbes India rich list; his personal worth was pegged at Rs 25,000 crores. Patanjali, which started out with a loan of Rs 50 crores, has a projected turnover of Rs 10,000 crores for the coming year, but Balkrishna says he is not paid a salary. He could do without it - he owns 97 per cent of the ayurveda empire. Yoga guru and spiritual leader Baba Ramdev helped conceive in 2006 of Patanjali as a manufacturer of everything from shampoos to toothpaste; he does not own stake in the empire, whose turnover zipped past Rs 5,000 crores last year, but is the face of the brand. Baba Ramdev, the face of Patanjali, does not own a stake in the business headed by Balkrishna. The only easily visible sign of luxury around Balkrishna at work is a gleaming black and white Range Rover which ferries him from his home to his office, and from one part of the Patanjali complex to another: the compound in Haridwar sprawls over 150 acres. When asked if he enjoys the cushy ride, he responded, "It's not about cars, it's just good to be safe." "I forced him to buy the car. We travel a lot and it is better to be safer in a sturdy car. We don't care about expensive things," said Baba Ramdev, pulling out a simple phone that he uses that he says cost him Rs 2,000. Balakrishna admits he has an iPhone. Having met over three decades ago at a gurukul or residential school in Haryana where they were studying, the pair quickly became close. 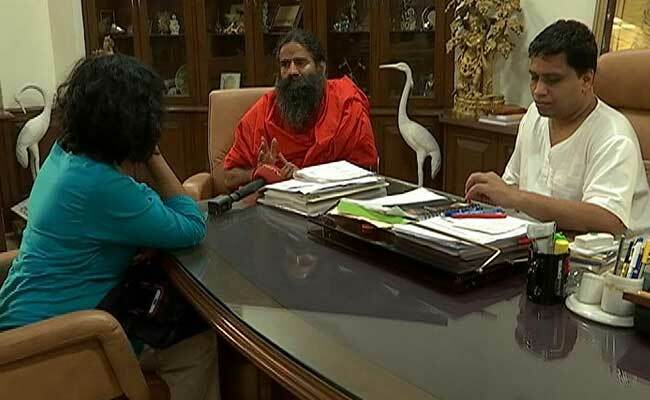 Baba Ramdev met Acharya Balkrishna over three decades ago. Balakrishna is shy, Ramdev is media-savvy; Balkrishna is stocky while Ramdev's wiry frame proudly perform tricky asanas at hugely-attended and televised master classes. Their working relationship is atypical. Ramdev describes his closest aide as "a spiritual friend and not business partner" while Balkrishna says, "It's not like we have board meetings. Sometimes, he comes up with an idea, and he knows what I want." The idea, apparently, can come from the most random of encounters. Like designing and manufacturing jeans. "What happened was that Ramdevji was being interviewed by a journalist wearing jeans and he commented on it. The journalist joked and said why don't you make them and we thought why not?" Since then, there has apparently been a deluge of requests, including from well-known and trendy brands for a joint venture. Essential to Patanjali's success is the emphasis on swadeshi or Indian-made. So what's swadeshi about jeans? "They can have local vegetable dyes," joked Balkrishna. Inside Patanjali, there is a well-referenced notion that Acharya Balkrishna never takes a day off. The Acharya honorific, used for a man of higher learning, was conferred on Balkrishna by Ramdev; it is a part of Patanjali parlance. Also well-referenced is the notion that Balkrishna never takes a day off; at the time of this interview, he was busy readying a new herbal park and museum in the Haridwar headquarters. "I want the best scientific aids for our Research and Development," he said, showing off a brand-new laboratory. Lined up outside are trucks which transport the butter to Haridwar for its transformation to ghee, Patanjali's top-selling product. Critics say that it is 50 something-year-old Ramdev's support and campaigning for the BJP that deleted cases, including one being handled by the CBI, against Balkrishna for forging his passport (his parents are from Nepal) and educational degrees. Detractors also say it's not just serendipity that Patanjali's enormous growth has coincided with the coming to power of the BJP. "It doesn't matter if the central government is favourable to us," said Balkrishna. "We need the state government more and they are forever against us. For every little thing, every No Objection Certificate, they make us suffer," he said of the Congress government in Uttarakhand.